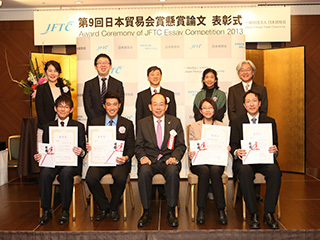 The Japan Foreign Trade Council invites entries Worldwide for the 2014 JFTC Essay Competition to encourage students, young researchers and business people to express their opinions on matters of national and international importance. Award winners will be publicly announced on December 12, 2014. The award-winners from abroad will be provided with a round trip air ticket to Tokyo, Japan to attend the award ceremony to be held on January 7, 2015. Anyone can apply for the Essay Competition, regardless of nationality or age. Essay should not exceed 4,000 words (English) or 10,000 characters (Japanese). Each essay MUST BE accompanied by an essay summary of no more than 400words in English/ 800 Japanese characters. Essays must be submitted in the specified format sheet. Unless both essay title and summary are presented, such application shall be deemed incomplete and will NOT be evaluated. Also, all submissions must be original and should be submitted with complete fill out of an entry form. No previously published materials will be accepted. All rights to the award-winning essays shall be the exclusive property of JFTC.